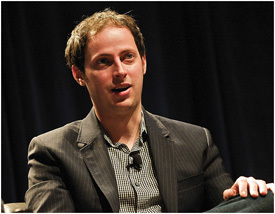 June 3, 2010, 4 p.m.
By Megan Garber @megangarber June 3, 2010, 4 p.m.
Big news today: Nate Silver and his wonderblog, FiveThirtyEight, are moving on up to The New York Times. Later this summer — probably in early August — FTE’s statistictastic posts will be found in the politics section of nytimes.com. And that makes the negotiations involved in the partnership — those that have already occurred, and those still to come, as FiveThirtyEight integrates into the NYT and vice versa — both tricky and, at the same time, rather fascinating. When two brands plan to marry, who determines the rules of engagement? The partnership began ten weeks ago, when Silver and Times magazine editor Gerry Marzorati ran into each other on an Amtrak platform in Boston; the initial idea was that Silver would write some pieces for the magazine. POSTED June 3, 2010, 4 p.m.
Garber, Megan. "Articles of incorporation: Nate Silver and Jim Roberts on the NYT’s absorption of FiveThirtyEight." Nieman Journalism Lab. Nieman Foundation for Journalism at Harvard, 3 Jun. 2010. Web. 20 Apr. 2019. Garber, Megan. "Articles of incorporation: Nate Silver and Jim Roberts on the NYT’s absorption of FiveThirtyEight." Nieman Journalism Lab. Last modified June 3, 2010. Accessed April 20, 2019. https://www.niemanlab.org/2010/06/articles-of-incorporation-nate-silver-and-jim-roberts-on-the-nyts-absorption-of-fivethirtyeight/.